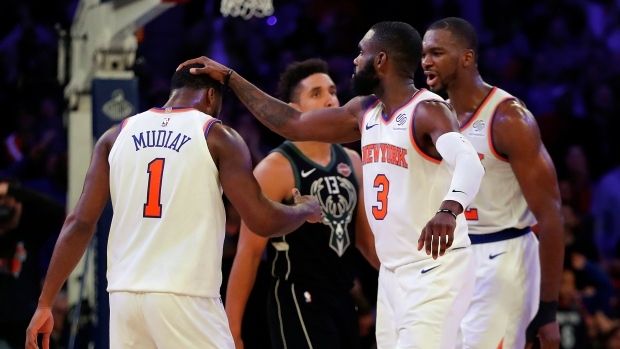 NEW YORK — In one locker room, the New York Knicks spoke about the fight they displayed over 53 minutes against the NBA's highest scoring team. Antetokounmpo was angry at Knicks forward Mario Hezonja, who early in the first quarter dunked on the Milwaukee star, then stared and stepped over him — much to the delight of the Madison Square Garden crowd. "They're a hard-working, competitive group," Budenholzer said in his pregame media availability. "Got a mix of, you know, a few veterans and some young guys. They play hard. Well coached. I think Tim Hardaway Jr. can get going. Put a lot of buckets up. (Enes) Kanter inside is a physical presence. Trey Burke and different guys — (rookie guard Allonzo) Trier has had a great rookie year — so I think different nights can be different guys. Impressed with what they doing."